Monique works as senior scientist at Unilever R&D and is part-time Professor of Psychology at Utrecht University. In both affiliations the focus of her research activities is on the sense of smell in particular in relation to social communication. Monique received her Masters degree in experimental psychology from the University of Amsterdam in 1990 and completed her PhD at Utrecht University in 1995. The topic of the thesis was body image disturbance in anorexia nervosa. In 1996 she obtained a stipend from the Niels Stensen Stichting which enabled her to spend time as a postdoctoral fellow in visual neuroscience working with Prof Stephen Kosslyn at Harvard University. In the years that followed she gradually shifted her research focus to the chemical senses, specifically smell, when working at the Monell Chemical Senses Center in Philadelphia under the supervision of Dr. Pamela Dalton. This is where she developed her fascination for the topic. In 2002 she returned to the Netherlands to join one of the research centers at Wageningen University. 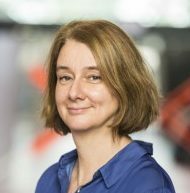 In 2004 Monique moved to Utrecht University where she held positions as assistant, associate and full professor and continued her chemosensory work with the support of a Vidi grant. In her dual affiliation, Monique sees herself as linking pin between industry and university progressing our understanding of olfaction from a fundamental as well as applied perspective. She hopes to one day be part of the unravelling of how smell works: all the way from the molecule to receptor to brain, perception and action.